There are big changes in the world of electronic financial payments. Visa and MasterCard, two of the industry’s largest companies, made headlines last week announcing their collaborative formation of an electronic security group. The cross-industry group aims to build up security for financial transactions by implementing EMV chip technology for credit and debit cards. Since the two companies overwhelmingly dominate the market in electronic financial services, the migration to the chip-based technology will impact a majority of American consumers and retailers. Visa and MasterCard are more than household names. The credit card processing giants facilitated the transaction of over $5 trillion in 2010. The two rivals advertise constantly on television and in magazines hoping to lure consumers to use their services. While they offer much of the same thing, their differences arise in their selection of non-reward “perks”. 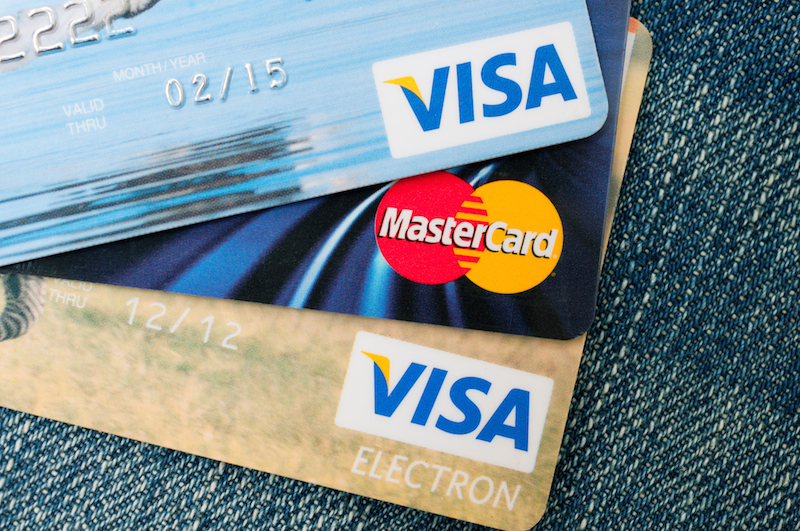 For more information, check out NerdWallet’s in-depth comparison of Visa and MasterCard. Why are Visa and MasterCard teaming up? Over the last few years, there have been several security breaches at major U.S. retailers leading to data theft of millions of consumers. Most recently, Target fell victim to a hack involving over 40 million transactions resulting in one of the largest breaches of consumer data in U.S. history. These events strained relationships between retailers and financial institutions that both deflect blame for the high-profile security lapses. Hints that the two rivals would be teaming up emerged in 2012 when they announced they had experienced problems with third-party security firms. Forming a multi-firm, cross-industry group gives them direct control over security and allows them to move towards standardizing EMV chip technology, which is already seen throughout Asia and Europe. Other members of the group include retailers, credit unions, banks and manufacturers of electronic transaction devices. EMV stands for Europay MasterCard Visa and is a global standard for the interaction of credit and debit cards and point of sale terminals. EMV cards store information on computer chips as opposed to traditional magnetic strips, which hold significantly less information and are thus easier to hack. The microchips add an extra layer of security by allowing card issuers to require a Personal Identification Number (PIN) for each card. The embedded chip also encrypts data uniquely for each transaction. Experts believe this will significantly lessen cyber-threats for in-store purchases. To address online and mobile transactions, the newly formed security group will encourage tokens. This process involves the substitution of a card’s account number with a randomly generated number of the same length (called a “token”) when the card is processed or stored in a processing system. With the right decryption keys, the number can be reverted back to the true account number. Currently, banks and credit institutions are issuing EMV cards to customers and many will send replacement cards by request. NerdWallet compiled a list of American EMV Credit Cards you can refer to if you are interested in acquiring the new cards. Besides being more secure, EMV cards are widely accepted throughout the world, making traveling much easier for consumers who carry them. Visa and MasterCard set an ambitious deadline for U.S. retailers to integrate the new payment system. Some stores have already begun the trend, but many have leagues to go. By October 2015, retailers and ATM owners must be able to accept chip-enabled smart cards. Customers accustomed to the swipe-and-sign ritual at U.S. cash registers will now insert their card into a reader, where the chip will be scanned for authenticity. While EMV chip-enabled cards have the ability to require PIN numbers for every transaction, Visa and MasterCard have not yet stated whether cardholders will use a PIN or continue using signatures. EMV technology is the first step in a long process to safeguard financials transactions and restore consumer confidence. The fact that Visa and MasterCard are cooperating is terrific news for consumers. The two competitors have shown data theft to be the industry’s greatest concern, so the time has come for a unified front against it. Visa and MasterCard image via JMiks / Shutterstock.